Jason Markk publishes a limited gift set every year. A beautiful gift to give or just to keep for yourself. The gift set is different every year, but this year we see a handy travel case with Ready-to-use foam, a mini Premium Brush, Quick wipes, a premium microfibre cloth and the sneaker cleaning apron. An apron that is useful when cleaning your sneakers, but also during the cooking of a Christmas meal. 2oz / 60ml Ready-to-use-Foam, immediately ready for use and the right amount of liquid for hand luggage while flying. 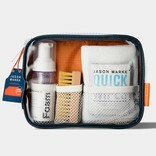 The Jason Markk Gift Set will be shipped the same day when ordered before 16:00h on weekdays. View our entire JASON MARKK collection.